On tuesday, 03/04/03 at 06.01 p m the VFDs Nittenau and Bergham got a call for a fire. Because of the extreme escape of smoke already during the approach it was obvious that this was a big situation. After a first state report to the dispatch center, VFD Nittenaus First Responder immediately started evacuating the building which was occupied by 88 persons, most of them evacuees from Eastern Europe. The following responders found a four-storied building burning in the attic storey, the roofing on some spots already burnt through. The fire spread very fast. 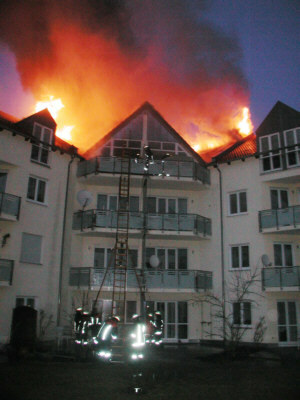 As there were still persons presumed to be inside the upper storeys an interior attack with four SCBA-teams via staircase and portable ladders at the backside of the building was started immediately. At the same time an exterior attack with two 3"-hose and the water monitor of VFD Nittenaus ladder began. The ladders from Schwandorf and Neunburg and the VFDs Bruck, Fischbach, Kaspeltshub and Neuhaus were called for support. In an apartment in the attic storey under extreme circumstances (see pictures) the SCBA-teams found a lifeless person and carried it down. The emergency doctor could only declare the person dead. 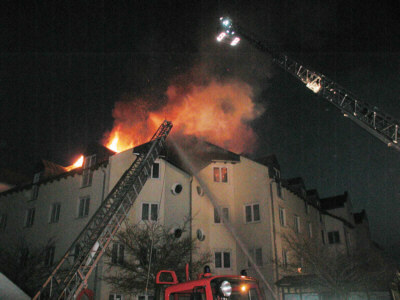 Because of danger of collapse the teams had to withdraw from interior attack after a short time, but all the apartments had been searched for occupants. 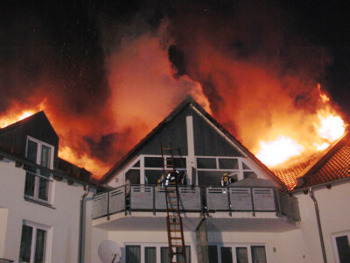 In the meantime the roof-truss of the buildings middle part was completely on fire. 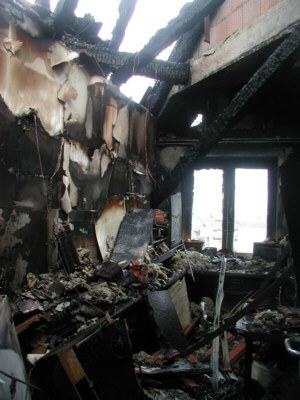 The right and left parts were separated by a fire proof wall which kept the flames from spreading. An efficient attack which soon showed success could only be started when the ladders from Schwandorf and Neunburg arrived. As the hydrants didn't supply enough water for firefighting, three more lines of 3"-hose from the river Regen (about 300m away) were set up. 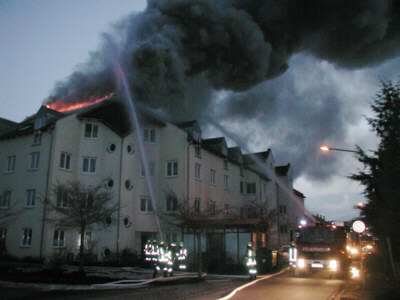 After about two hours the fire was under control, small fires had to be extinguished until about 08.00 a m the next day. The recording of the occupants by the Bavarian Red Cross brought up difficulties: it turned out that more persons were living in the building than were registered at the registration office of the town Nittenau. The catering for the firefighters and rescue workers was also provided by the Bavarian Red Cross. All in all this fire demanded one dead and four injured persons.